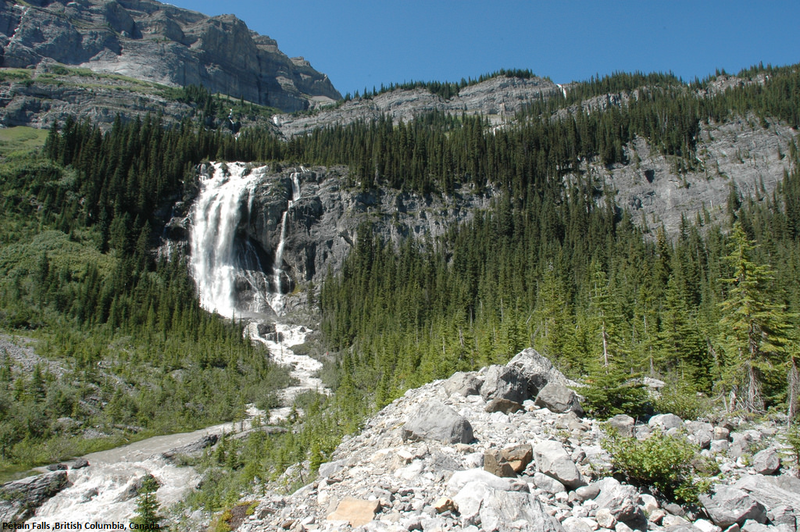 Pétain Falls is one of the more significant waterfalls in British Columbia and stands among the best falls in the Canadian Rocky Mountains. The falls plunge approximately 1230 feet in three major steps (approximately 350, 375 and 275 feet respectively) with interstitial cascades in between. The easterly facing headwall where the falls are located consists of a substantial anticline which has forced the direction of Pétain Creek to shift south as it falls, resulting in the bottom of the falls being situated almost 1000 linear feet off-center from the top of the falls, and the run of the stream between the top and bottom of the falls to extend for almost 2000 linear feet even though all three tiers are not spaced very far apart. From Elk Pass parking via #58 West Elk Pass and #60 West Elk Pass to Elk Lakes Provincial Park. Drive Elk River Road from Elkford, BC. ACC's Elk Lakes Cabin. This is the main valley trail, and it is easy. Make of it what you will a stroll or bike to Lower Elk Lake with a side trip to the viewpoint, a full day hike to Petain Falls, or as access to tougher trails climbing into the cirques.